1998 : The group invests in the development of offshore industrial activities. The company Travocean is bought and becomes Louis Dreyfus TravOcean (formerly named LD TravOcean). This new subsidiary brings its know-how in the field of maritime works and underwater projects, namely underwater cable burial and installation. 1999 : Development of the seismic and oceanographic research activities with a fourth vessel entering the fleet and built by the Chantiers de l’Atlantique: CGG Alizé. 2000 : LOUIS DREYFUS ARMATEURS furthers its diversification strategy through partnerships with big names of the French industry : Alcatel-Lucent in 2000 and Airbus in 2002. The partnership with Alcatel, through a joint-venture named Alda Marine, would lead to the building of three brand new cable laying vessels: Ile de Sein, Ile de Batz and Ile de Brehat in November 2001. They were built at Hyundai’s Mipo Dockyard in South Korea. A fourth vessel, Ile de Ré, would later join the Alda Marine fleet, after its 2002 conversion in Poland at Remontowa shipyards. Louis Dreyfus Travocean, the group’s specialised subsidiary in underwater works, would ensure a complementary activity to Alda Marine’s. 2001 : LOUIS DREYFUS ARMATEURS took first steps in ferry roro transportation operating regular services from Marseilles to Tunisia. 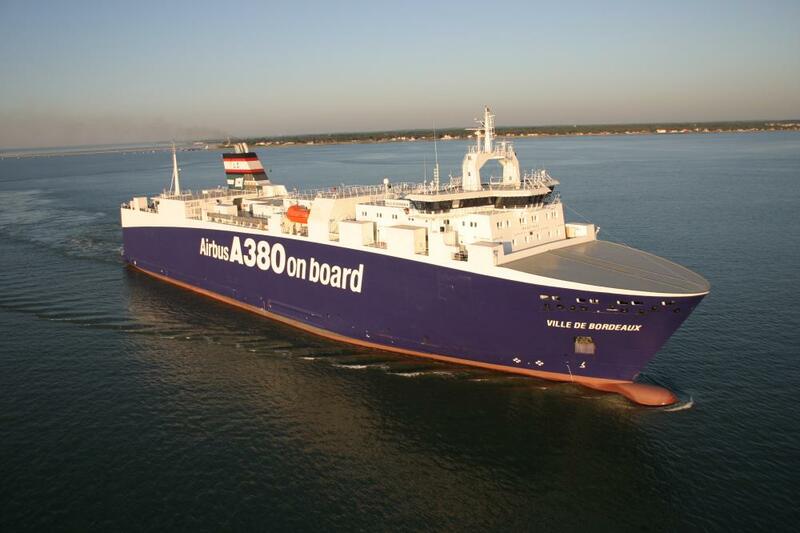 This year, Fret-CETAM, a joint-venture between LOUIS DREYFUS ARMATEURS and Leif Höegh, signed a contract with Airbus to transport the parts for the A380 between its different production sites in Europe. In that perspective, a RoRo vessel is built with the latest technology. The Ville de Bordeaux was built in 2004 at the Jinling shipyard in China. 2004 : LOUIS DREYFUS ARMATEURS invests in the “motorways of the sea” concept along with its Italian partner, the Grimaldi group, thus becoming the first French shipowner to offer this kind of service. The two partners launched a regular line (closed since 2009) between Toulon and Civitavecchia then operated by Eurostar Velencia ship. 2005 : Meanwhile, three double-hulled capesize vessels were ordered to DSME: Jean LD and Pierre LD (VII), both with a capacity of 172,000t dwt. The third vessel was sold on wedge.